We leave Sarajevo, heading in the direction of Mostar. The 40-kilometer drive to Konjic, on the Neretva River, takes about an hour. Although it’s raining when we arrive, the climate is warmer in this area and more Mediterranean. “It’s not so nice to spend the day on the river in the rain,” Amel said. “But let’s wait for a bit.” I’m still feeling a bit critical of the idea in general, but my interest in the whole endeavor is starting to grow. 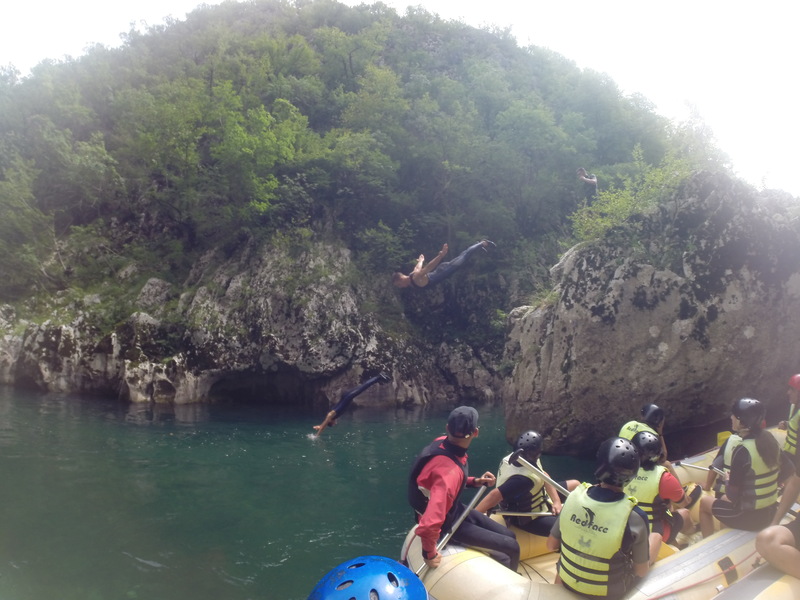 This only continues when we arrive at the Neretva Rafting Đajića Buk Camp. Situated directly on the river, you can sit on the terrace and look into the water, which is as clear as glass, flowing past. As I do this, fine pearls of water settle on my face. The rain has stopped by now, and the light gray clouds can’t detract from the beauty of the landscape. Before rafting, it’s time for breakfast. “Time to get strong,” Amel says, grinning. His friend from Međugorje, Alen, and Alen’s two sons are with us. 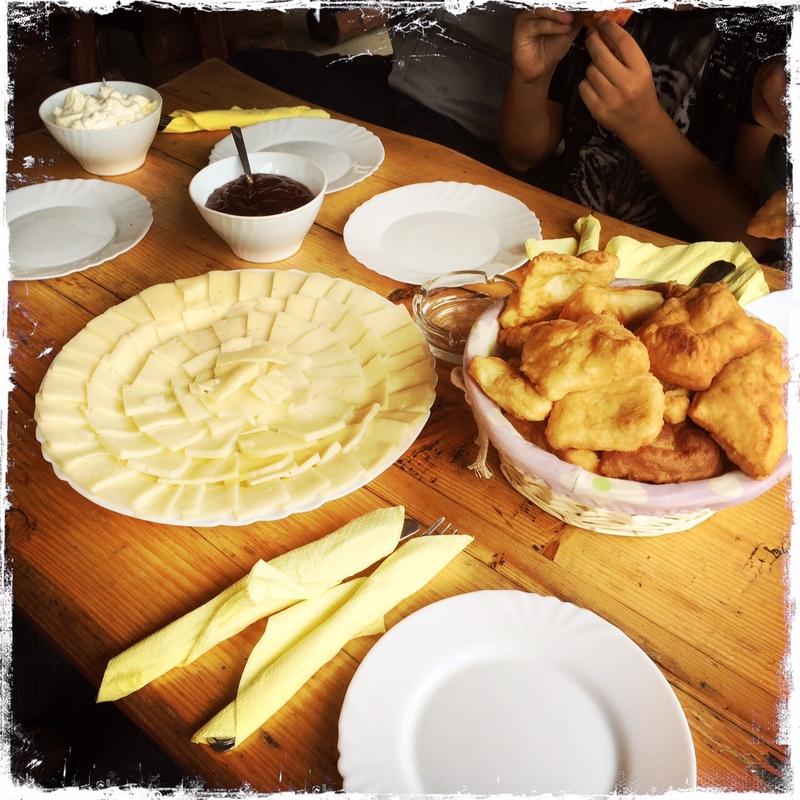 We are served uštipci, which is salty fried dough, along with kajmak, jam, dried meat, cheese, and boiled sausages. We all dig in – the fresh air has made us hungry. It tastes like home, with everything fresh and homemade. After breakfast it’s finally time to get going. “This is Dženan. He’s your skipper and will take care of you while you’re rafting,” explains the lady of the house. A tall, young, blonde man with the body of a model and a BMI of something like -10 stands in front of us! 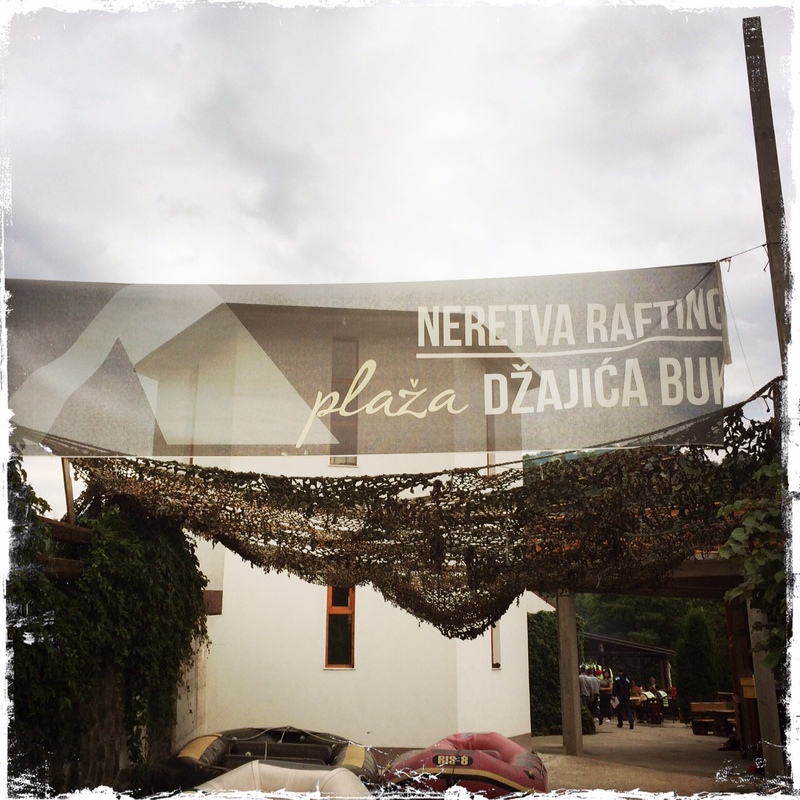 We get dressed and board the bus, which will take us to Džajići, where the rafting begins. The bus takes us up and up. I’m a bit annoyed. Is the plan to fall down into the river, as if on a slide? I certainly hope not. The queasy feeling I’m experiencing begins to spread. I have images in my mind of how I’m going to be catapulted down a waterfall the size of Niagara. The only thing to distract me from these stupid thoughts during the ride is the nature we pass by – pristine forests, villages with just a few houses and their well-manicured gardens. Everything is green. 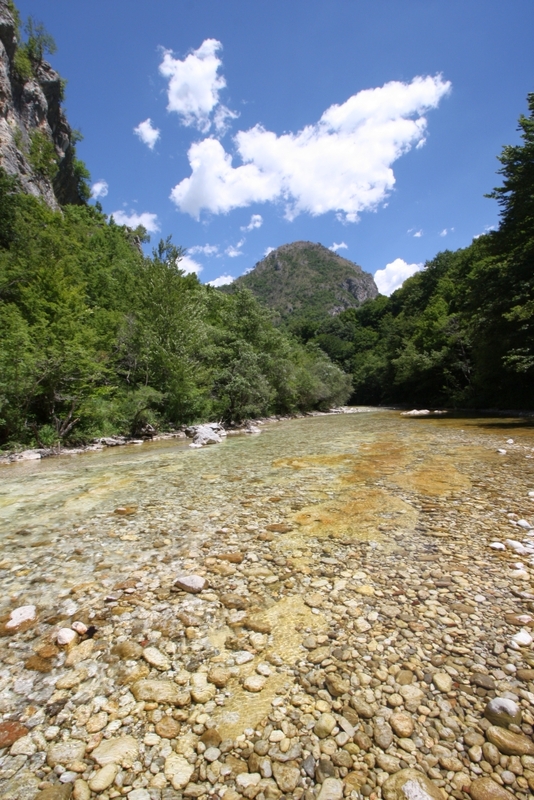 On the right side of the road is the deep valley through which the Neretva flows. We eventually begin descending. We just had to drive up and over a mountain in order to reach our destination. We bring our rubber boats to the gently flowing river together. Most of the clouds are gone by now, and the sun’s rays are shining down on clear, emerald green waters. “Sit in the back of the boat on the right side and paddle,” the skipper says, handing me a paddle. I have no idea how this is supposed to work, but Dženan’s muscular body helps me outsmart my weaker self. “The trip to the base takes about four hours and we’ll pass through four ‘adrenaline points.’ The level of difficulty increases as we go along,” he tells us. The only words I hear are ‘adrenaline’ and ‘level of difficulty.’ Oh great – this is going to be interesting. I’m already in the raft though, so I’m going to see this through. “And, what did I tell you?” Amel remarks. “I knew the sight of nature like this would leave you speechless!” I had been concentrating so intently on everything around me that I’d completely forgotten everything else. I must have been sitting there with huge eyes and my mouth wide open. The only thing I hadn’t forgotten was that I needed to keep paddling. I didn’t dare slack off under Dženan’s watch. “You have to paddle! Otherwise we won’t get anywhere,” was what we heard from Dženan frequently. Then we came to the first ‘adrenaline point.’ We actually began moving more quickly through the high rocks. We had to paddle in the right direction so that we wouldn’t get stuck in the rocks. This was an adventure indeed! Once we’d made it through, things calmed down again. “If I had known that the ride would be so relaxing I would have brought a bottle of water,” I said, feeling thirsty. “Why? There’s plenty of water here,” said Dženan with a grin. “If you’re thirsty, go right ahead,” he said, nodding his head in the direction of the river. “What water? You don’t mean that I should drink straight out of the river!” I thought he was making fun of me. “Just dip your hand in and have a drink. It’s not a joke. This water is perfectly clean.” I did just that, and I was glad that I had. The water tasted wonderful! We reached a high cliff and it was time for a break. Dženan and his colleagues impressed us with their elegant dives off the cliff. A few members of our group did their best to imitate them. 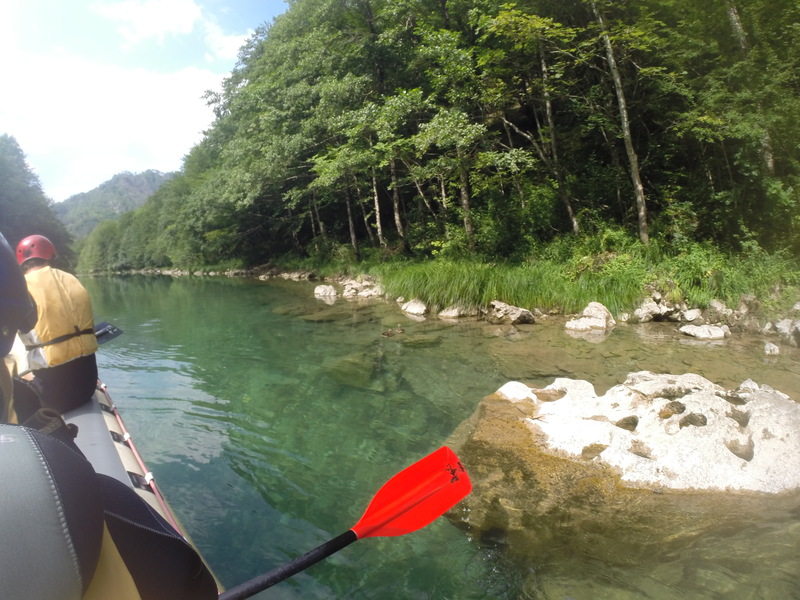 After that we continued on to the point where the Rakitnica River flows into the Neretva. The Rakitnica is so very different. It is very flat, and in the sun it almost seems yellow. The water here was clear as well, and we could see each individual stones. Dženan showed me a crayfish typical for this area. “There is all kinds of life here, many animals that can only survive in clean waters. As long as they’re here, we know everything is alright,” our skipper explained. Dženan tells us that there had been a plan to build a hydroelectric power plant here a few years ago. Bosnia and Herzegovina’s population united, mobilized, and protested against this. The power plant would not have only ruined the beautiful view; it would have also damaged the nature. In the end, the construction of the plant was prevented. 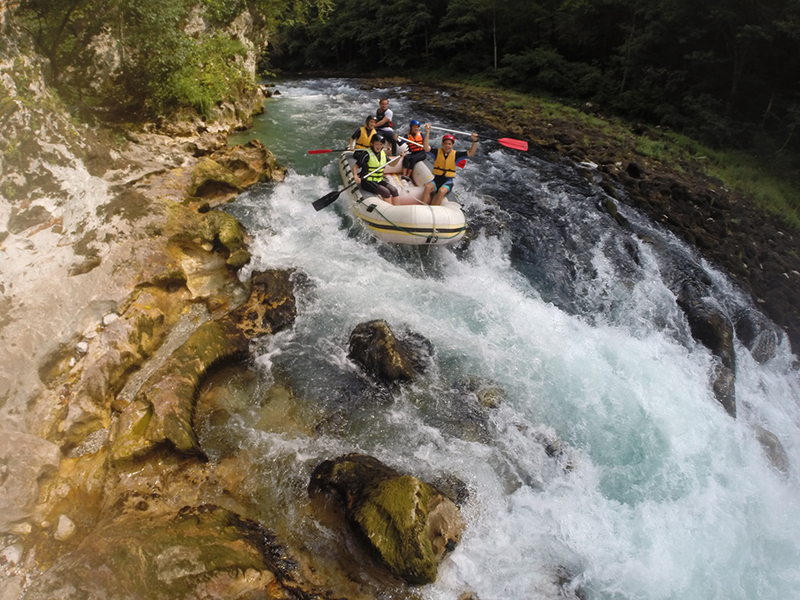 Dženan, a student from Konjic, has been rafting since he was five years old and earns his pocket money as a skipper. This would no longer have been possible had the power plant been built. The other three ‘adrenaline points’ were fast and exciting. Here too we had to paddle quickly so as to maintain the correct position in the surging waters, allowing us to make it safely through the narrow canyons. In between the ‘adrenaline points’ we passed by small waterfalls flowing from the cliffs. A very proud group from Slovenia came up beside us, and passed us with their heads held high. 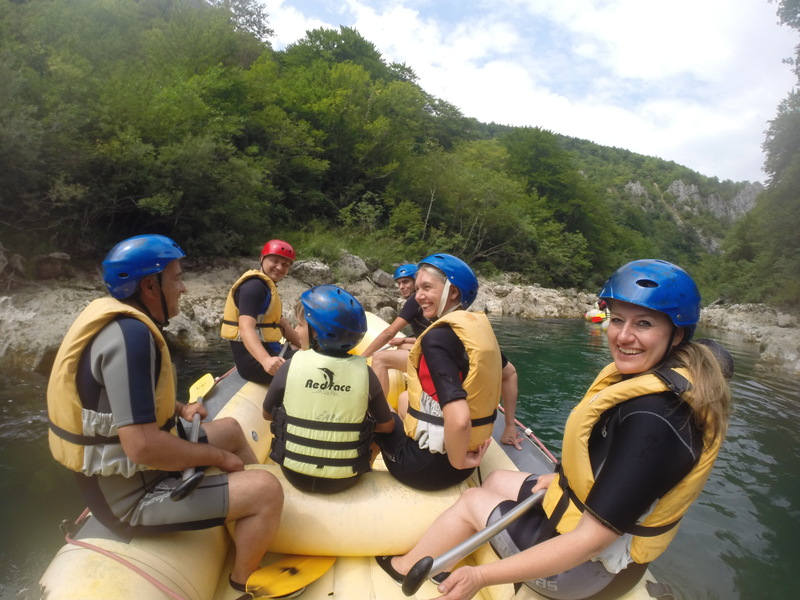 They meant to seem very professional, as though they were mocking our comfortable Balkan style of rafting. Eventually we overtook them when they stopped for a break next to one of the small waterfalls. The most challenging ‘adrenaline point’ really was at the end. Here, the surging water mixed with a small waterfall. We had to work together – and quickly – to make it through. Dženan shouted and encouraged us to paddle faster. “That’s good….perfect!…we’re going to make it through….WELL DONE!” We’d made it through. We all sat on the raft, happy and relieved, and pushed along by the river. The Slovenians came up behind us. Dženan got out of the boat to take a few photographs of their rafts. We sat nearby and watched. Alen was happily smoking a cigarette beside me. For whatever reason, the Slovenian raft got stuck on a rock and couldn’t move forward or backward. Alen and I gave each other a look. “Aren’t those the Slovenians who laughed when they passed us before?” he asked. I nodded. He looked at them and grinned. “Too bad for them, they missed the ‘adrenaline point,‘“ he remarked. “I can’t help but feel a little Schadenfreude though.” We had a good laugh. A few skippers had to help the poor Slovenians so that they could get going again. Several people fell out of the raft behind the Slovenians who’d been stuck – but no worries, it’s absolutely harmless. Everyone has a helmet and a lifejacket. Plus, the swift currents are over quickly and anyone can swim to the shore or grab onto the raft. Here’s a tip: leave your cell phone at the raft camp! There is a safe where valuables can be stored. Even though the river generally flows slowly, you can drop your cell phone anytime. One of the skippers always has a GoPro and is ready to take your picture whenever you’d like. I’m glad that Amel succeeded in persuading me to go on this adventure. 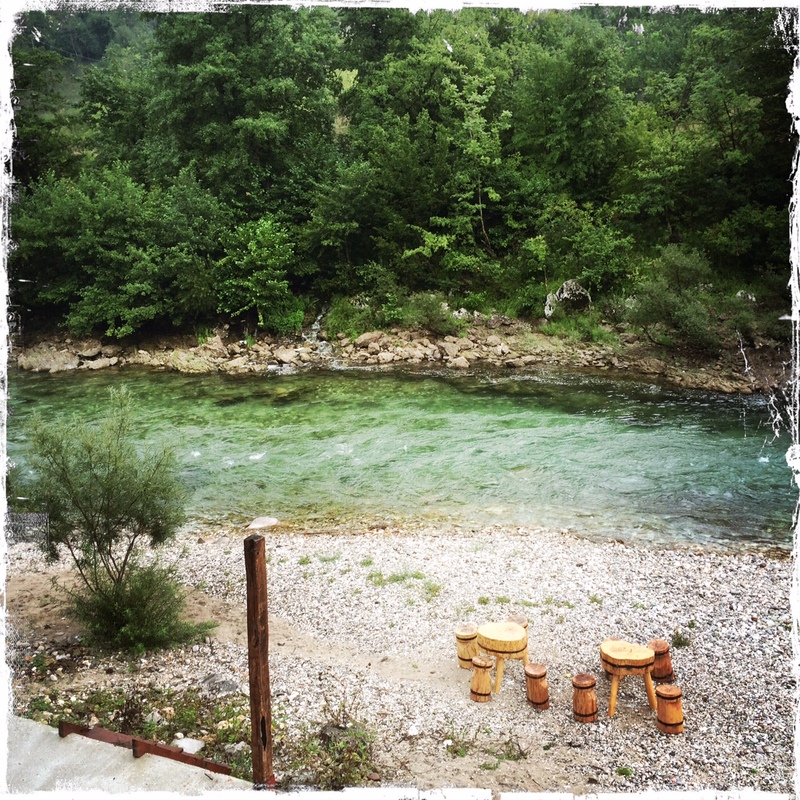 It was true – I really did get to learn more about the nature and the legends of Bosnia and Herzegovina. Rafting isn’t only interesting for tourists who are in the country for the first time; it’s also great for locals who enjoy such excursions. For me, I have to say that rafting is wonderful! At the time when saints traveled the country, there was a town at the location where Boracko Lake now lies, but whose name is no longer known today. The inhabitants of this town were very rich and stingy. They were so blinded by their materialism that they knew nothing of charity. One day, a saint came to the town and asked for lodging for one night. None of the town’s residents wanted to help him, and they shut their doors in his face. After asking at all of the houses in town, the saint came to the small home of a poor widow and her young son. They had nothing but a miserable shack, a cow and a horse. However, they were very religious and the widow’s heart was full of love. The poor woman welcomed the traveler warmly, shared their food with him and offered him a place to sleep in her home. “I will punish this place for its sins,” thought the saint. The next day, as he was bidding the mother goodbye, he told her: “Pack your things, bring your son and ride directly northwest. Once you come to the river, ride along the water until the point where the horse puts his front right hoof into the ground three times. God will reward you for your hospitality and love.” The mother and son followed the instructions of the saint, and off they rode. The visitor stood in their door, watching them go. As they turned back to cast a final look at their home, they shuddered! Horrible cries erupted from the village as the ground opened, swallowing the place whole. It was then covered by a lake. At the very same moment, the saint disappeared before their eyes. And this is how Boracko Lake, near Konjic, was formed. The mother and her son rode along the river, as the saint had instructed them. After several hours, the horse did not want to continue. The mother urged the horse to go on. It refused to listen. Suddenly, it scraped its hoof three times on the ground. The mother realized that they had come to the place that the saint had told them about. They settled in that place and built a house. Soon afterwards, her son was happily married. They received divine protection. More and more people joined them in this new place, and this is how Konjic (‘Konj’ means horse) came to be. Konjic was named after the horse that had found this location. The day-trip described above costs 80 km (approx. 40 Euro) per person. 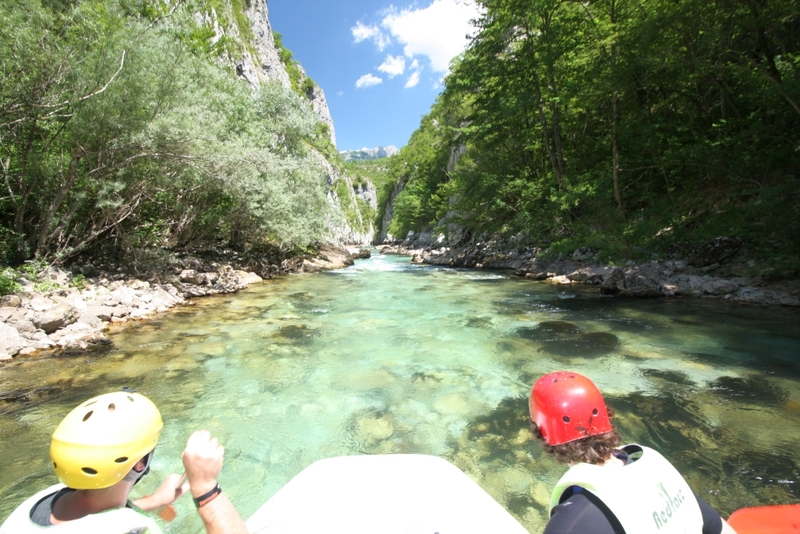 You can book it at the following link: Neretva Rafting Dzajica Buk. For more information regarding other tours and sites in this area, please see Come, Enjoy, Pass It On (beginning on p.4). Many thanks to Amel Salihbašić, who provided special organization of this excursion for Balkanblogger! 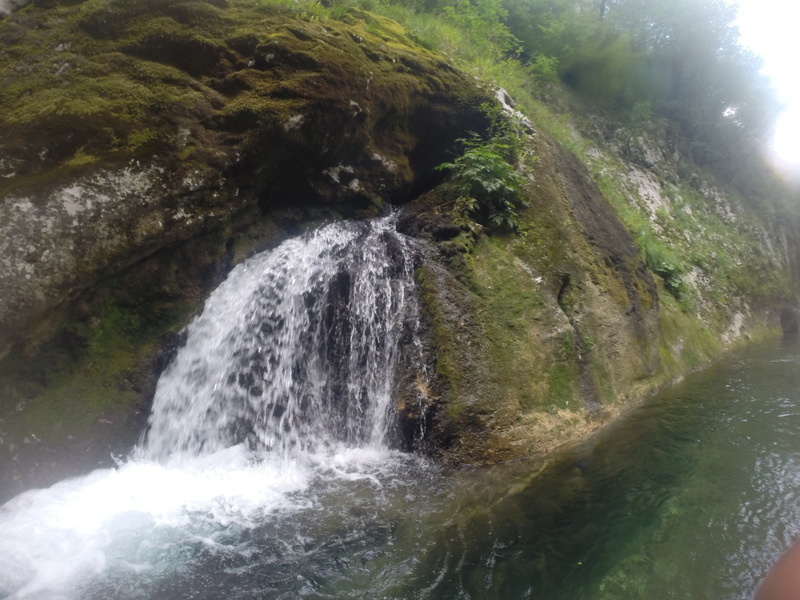 Uštipci, Uštipci – oh, that alone is reason enough to try and master a wild river Streaming through narrow gorges. And one does get some great nature to look at atop of that. Admittedly I probably would skip the rafting part but a trip along the Neretva seems worth considering for one of my next trips. Hvala lepo. I’ll do that.